Extensible Markup Language (XML) refers to the encoding of documents such that they can be read by both machines and humans. 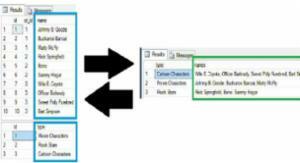 XML documents use tags to show the beginning and end of a set of data. XML is used extensively on websites to show volumes of data, and is the default for a number of office productivity suites. This topic includes discussions of XML-related technologies, such as XQuery (the XML Query language), XPath (the XML Path language), XSLT (eXtensible Stylesheet Language Transformations), XLink (the XML Linking language) and XPointer (the XML Pointer language). Create a Windows 10 custom Image with custom task bar and custom start menu using XML for deployment. Many times as a report developer I've been asked to display normalized data such as three rows with values Jack, Joe, and Bob as a single comma-separated string such as 'Jack, Joe, Bob', and vice versa. Here's how to do it. Done. This is a republication from My Website which is allowed with the NoIndex checkbox checked per recent rules change. I was working on a PowerPoint add-in the other day and a client asked me "can you implement a feature which processes a chart when it's pasted into a slide from another deck?". 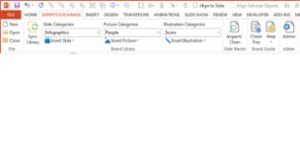 It got me wondering how to hook into built-in ribbon events in Office. Browsing the questions asked to the Experts of this forum, you will be amazed to see how many times people are headaching about monster regular expressions (regex) to select that specific part of some HTML or XML file they want to extract. The examples in this article are code in PHP. Even when their regex seem to work for their case, they realize that it is very hard to have a regex which is safe in all cases. V.gr., if you try to match the beginning of a paragraph, which is one of the simplest things you could imagine, you will try to match "<p>", isn't it? Well, in that case, you are going to miss <P>, like in the first versions of HTML. I can already hear the answer of the regex fans: You only have to adapt your pattern to match "<[pP]>". What happens when the coder of the HTML makes use of his liberty to add spaces between "<p" and the closing ">" like in "<p >"? The regex aren't still defeated: you can save the coding by having "<[pP] *>" as pattern. And what if I want to match also <p some-attribute="some-string"> along with <p> without attributes? No problem: the regex becomes "<[pP][^>]*>". Pretty simple, no? But is doesn't work when one of the attribute strings contains a ">" char, or when the opening < and the closing > are on different lines, and that's really the point: XML and HTML files are not organised line by line as regex are written for. Hi. How can I fetch an XML from a remote URL that also required credentials login? I have no clue how set up the package. Hi. How can I fetch an XML from a remote URL that also required credentials login? I have no clue how to set up the package. I recently had an investment company ask me how they might notify their constituents about their newsworthy publications. Probably you would think "Facebook" or "Twitter" but this is an interesting client. Their constituents are mostly bankers and builders. The average demographic was male, 50 years old, using a desktop computer, and occasionally a Blackberry. Not exactly the Twitter crowd. We considered using broadcast email, but the client wanted something more automatic and less intrusive. And since attachments may not make it to a Blackberry something other than email seemed to be needed. When the investment company released a publication, they made a PDF for print and they were willing to use FTP to place a copy of the PDF on their web server. But that was the extent of their interest in the process; they wanted automation to handle the rest. So we arrived at the idea of an RSS feed. It was automated, and just low-tech enough that everyone could understand it. An RSS feed is simply a specialized subset of XML. It carries only a few bits of information, such as a title, description and link. RSS is very ightweight and easy to use. A competing standard, Atom, is quite similar. We chose RSS because everyone at the meeting had heard of it, perhaps because it also forms the basis for podcasting. 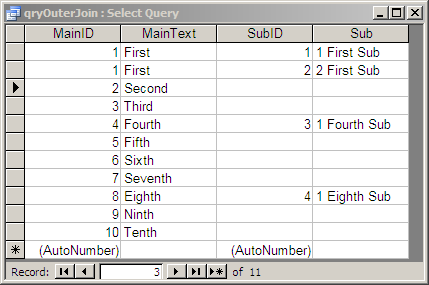 How to write an Xquery that works like a SQL outer join, providing placeholders for absent data on the outer side? I give a bit more background at the end. Let’s work through this. I’ve mocked up some data in Access, as I can’t share the original data with you. We have some data in tblMain, and some related data in tblSub. We’re going to write a query with an outer join so that we can see everything in tblMain and related data in tblSub. Here are some screenshots to illustrate. MainID is the Primary Key in tblMain and the Foreign Key in tblSub. 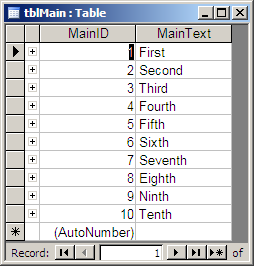 The result of this SQL is shown in the next figure. As you can see, and this will be no surprise to you folks who work with databases, the datasheet has empty cells where there is no matching data from tblSub. Now let's contrast this with the XML case. The same data, once exported to XML, is as follows. I posted this to the x-query.com mailing list, and so far I've had two really great responses. 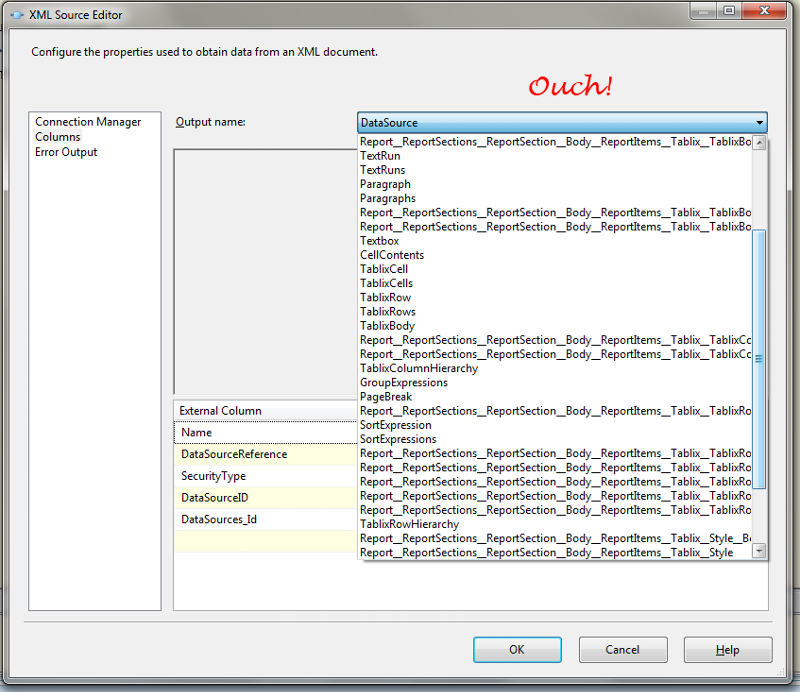 Both of these illustrate some great lessons in XQuery. For me, they are a lesson in how I think in SQL, and can visualize SQL solutions, but still really struggle to do so with XQuery. However, I've been developing with XQuery for fifteen years and with XQuery for three months, so maybe that's not a surprise. 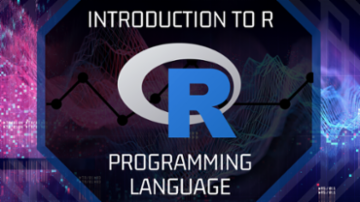 I've got to write queries based on what I've learned here that will operate on XML data representing millions of rows of relational data. I'll try all three approaches and check them for performance, then I'll post the results here. Here's the code for Martin's solution - it didn't make it to the last comment!